As we enter the final week of ForColumbia 2018 preparations, the excitement level is rising! We’ve had dozens and dozens of people working hard to plan this year’s day of serving on Saturday, April 28. Nearly 100 people have agreed to lead work sites so that over 2,000 volunteers from more than 55 area churches can work together, side by side, to show the love of God to our city. We think this is something to celebrate! So that’s what we’re doing. “Party in the Park” is all set to begin at 5 p.m. on Friday, April 27, in Douglass Park, 400 North Providence. 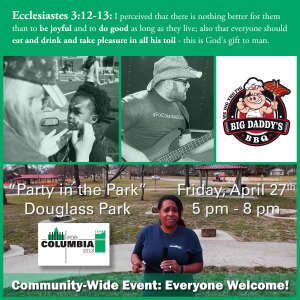 We hope you’ll make time to join us in the heart of our city for some delicious Big Daddy’s BBQ, live music by local band Sifa, inflatables for the kids to jump around on, giveaways and plenty of fun for the whole family. Yes! “Party in the Park” is a community-wide event. Everyone is welcome.